Yesterday, I finished the center of the Double Four Patch quilt. I just need to add borders now and quilt it. 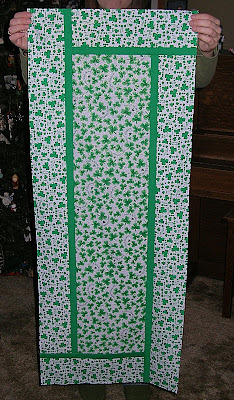 I also got out the shamrock / St. Patrick’s Day fabric that Pam sent me last year and made a couple of table runners. These need to be quilted as well. Notice the socks of the quilt holder? She specifically asked to be “cropped out of the picture”. I couldn’t resist showing her feet since they matched the table runner! 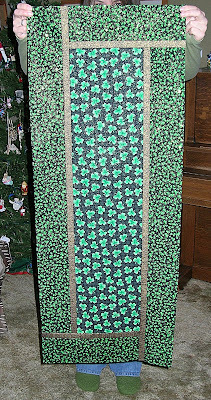 This entry was posted in double four patch quilt, st. patrick's day, table runner by Norma Hanson. Bookmark the permalink. I really like your double four patch. Very nice choice of colors. We had a white Christmas too but I’m afraid ours is here to stay. ohhhhh the double four patch looks wonderful! can’t wait to see what you chose for the border.. The greens and lights are really nice — looking forward to seeing the borders on this one! You certainly have been in a green mood! I do that too, focus on a particular color or scheme for a while – makes it easier to sew, less thread changes! Both of your projects look great. I particularly like the double four patch – looks like stepping stones on a meadow, and the matching socks! Sheesh! You are so ahead of the game! Good looking St. Patricks day decor…. You are making the rest of us look bad!!! Stop it! Please make up a complaint about not finishing your Christmas list or something so you can make us all feel better!!!! Those Irish table runners are cute. You are ready for St. Patrick’s Day. I like the greens in your Double Four Patch too. Love your Double Four Patch in greens! I think you have been having a ball with with all this stitching up lately. 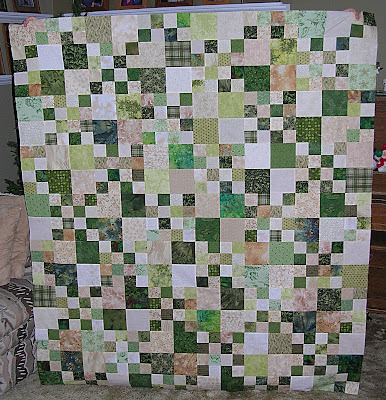 Not only making the quilt Mary inspired you to make, but getting ready for St. Pat’s already. Making up for that lost time with all those customer tops you quilted before the holidays? Or you need to sew down some of that recently purchased stash? That green double four patch is stunning.